Fee: $25/person - Includes camping for three nights, two meals, all instruction, safety equipment and evening activities. 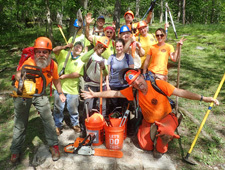 Join the Trail Crew At Carter Caves State Resort Park! Description: Join the Carter Caves trail crew and spend a weekend at Kentucky's best kept secret learning about and doing trail maintenance. Your volunteer efforts will improve the trails at the park and make them safer and more enjoyable for park visitors. Projects include fixing erosion problems, installing water bars, removing downed trees, installing check dam, painting blazes, side hill maintenance and installing non-slip surfaces on wooden bridges. This is a three night campout with 2 1/2 days of working on the trails. No experience required. Upper body strength not required. This is for men and women of all ages. Tools, safety equipment and instruction provided. You'll be taught the basics of trail maintenance and will put those techniques to use. In the evening, enjoy fun activities at the park. Give back to the trails! Come with a friend. Limit 10 participants. Minimum: 5. Registration Has Closed. This same Trail Crew outing is also offered on May 9 - 12, 2019. About Carter Caves: The beautiful setting of Carter Caves State Resort Park is the ideal setting for this trail crew event. Nestled in the hills of Eastern Kentucky, Carter Caves is 2,000 acres of wooded hills rich in plants, animals and geologic formations both above and below ground. 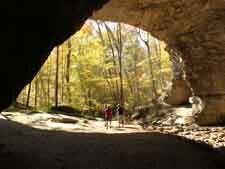 Carter Caves is home to over 30 miles of hiking trails and over a dozen caves. Thursday: Arrive at the park late afternoon. Set up your campsite. 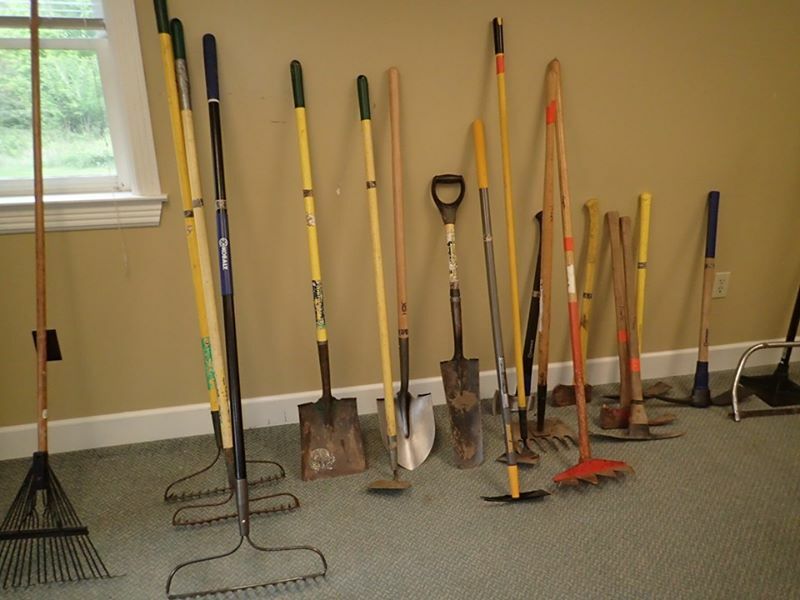 At 7:00 pm we'll meet for orientation, introductions, safety talk and instruction on the basics of trail maintenance. Afterward we'll get underground for a short commercial cave tour. Friday: Our workday is from 8:00 am - 3:00 pm. Plan on spending the whole time outside on the trails. We'll meet again at 5:30 pm for a pizza dinner. After dinner we'll enjoy an optional, fun activity at the park. Saturday: Our workday is from 8:00 am - 3:00 pm. Plan on spending the whole time outside on the trails. We'll meet again at 5:30 pm for a buffet dinner in the lodge restaurant. After dinner we'll enjoy an optional, fun activity at the park. Sunday: Our workday begins at ??? and ends at noon. We will use this time to finish up any projects and clean tools. Depart. Thursday: Walking Tour of X-Cave. X-cave has two vertical joint passages that meander through a large layer of limestone which puts you up-close to many beautiful cave formations. Some of the highlighted features include turkey rock, the pipe organ, and the giant column which is the largest cave formation found at the park. Be aware of your surroundings and you will discover how this cave became known as "X-Cave." Friday - Wildflower Program in the Lodge. Saturday - Box Canyon Hike & Cascade Cave Tour. At .8 miles Box Canyon is one of our most scenic trails and passes unusual geologic features in the park, including the Cascade natural bridge, the Box Canyon and the wind tunnel. Cascade Cave is one of the largest of over 200 caves in Carter County and is noted for its large chambers and numerous cave formations. Highlights of the tour include the reflecting pool in the Lake Room, the unique cave formations in the Cathedral Room, and an underground waterfall over 30 feet high. Camping: Bring your tent as camping is included in your registration fee. Our campsite is the secluded backyard of a cottage in the park away from the main campground loop. There is plenty of flat, grassy area for your tent. You'll have access to the cottage to use the bathrooms, showers, kitchen, refrigerator, microwave, stove, coffee maker, TV, and garage. The cottage will serve as our field house. 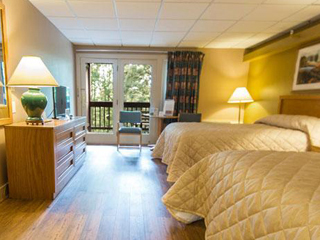 Alternate Lodging: Need your own space? Feel free to get a lodge room, cottage or a campsite in the main campground at your own expense. Comradery, fun and a sense of accomplishment! Lunch - Pack Your Own. On The Trail. Check out our List of Items To Bring so you are fully prepared! Andy Niekamp. 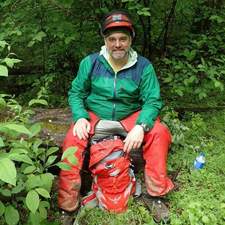 Andy Niekamp is an experienced trail crew leader with the Kentucky State Park system. He has led volunteer trail crews from the Americorps and American Hiking Society for the past several years. Andy is a section supervisor for a 50-mile section of the Buckeye Trail and North Country National Scenic Trail in Ohio where he oversees a crew of trail adpoters. He can be found joining trail crews on the Florida trail during the month of Febrary. Andy is a certified chainsawyer by the United States Forest Service and is a Wilderness First Responder. 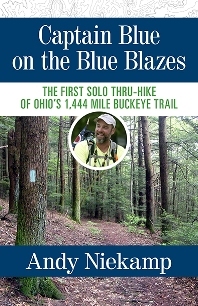 Andy has backpacked over 14,000 miles including four end to end hikes of the Appalachian Trail and thru hikes of the Buckeye Trail, Ohio To Erie Trail, Sheltowee Trace, Long Trail, Ozark Highlands Trail, Colorado Trail, Superior Hiking Trail and the Bartram Trail. Andy is founder and leader of the Dayton Hikers group, the largest outdoor recreation group in Dayton, Ohio, and a Leave No Trace Master Educator. Andy Niekamp grew up and lives in Dayton and has a passion for long distance hiking which he shares with others. Andy brings his wealth of backpacking experience and his passion for trail maintenance. Operated on Kentucky State Park lands in Carter Caves State Resort Park with special permission. I can't imagine anything being done differently in regards to leadership, introduction, prep and planning. The experience exceeded my expectations. – Monika M.
I liked our accommodations, food, and evening activities. I enjoyed meeting the Carter Cave park staff. – Debbie B. The accommodations were awesome and really enjoyed the variety of evening activities. – Barb K.
The schedule was good. One week was perfect. Work/play ratio was great. – Sterling D.
I appreciated mix of experienced and newbies. – Karen K.
Cancellation Policy: No refunds. Your registration fee is non-refundable. Important: All participants must complete an trail crew application and sign a liability waiver. Trail Crew Application PDF to download/print. Application must be returned for your registration to be confirmed. Notes: Recommended age is 18 and up. No pets permitted. Our events non-smoking. Details will be sent via email to registered participants. By signing up you agree that you can arrive at the park on Thursday evening and stay until Sunday morning. I went on the trip to the Appalachian Trail. Awesome time as usual with Lucy and Yvonne! – Joy W.